Few visitors to the eclectic and unique Sir John Soane’s Museum can fail to be inspired by their star attraction, particularly if (like me) they are fortunate enough to have seen it during one of their candlelit evening openings. This beautifully illustrated volume explores the complex history of the calcite sarcophagus of Seti I, one of the most important antiquities ever found in Egypt for many different reasons. The reader is treated to an indepth overview of the ancient and modern contexts of the sarcophagus: from its creation as the eternal resting place for the earthly remains of one of ancient Egypt’s most famous pharaohs, to the history behind its current location in Lincoln’s Inn Fields, London. The sarcophagus was discovered in 1817, in the burial chamber of the tomb of Seti I in the Valley of the Kings, by the illustrious explorer Giovanni Batista Belzoni. When describing the sarcophagus, Belzoni stated that he “cannot give an adequate idea of this beautiful and invaluable piece of antiquity”. Subsequently transported to London and acquired from the collection of Henry Salt in 1824 by Sir John Soane, the sarcophagus became an instant sensation and ultimately came to influence the reception of ancient Egypt and of Egyptology as a discipline. The intricate decoration of the sarcophagus is addressed in detail by the author, who provides a useful overview of royal funerary texts of the New Kingdom before breaking down the main subject of the decorative scheme – the Book of Gates – into its constituent scenes. This provides a clear guide to the inscriptions for all visitors and allows them to follow the story in a logical way, using labelled diagrams of the sarcophagus, which is also equally useful for those enjoying the book away from the Museum. 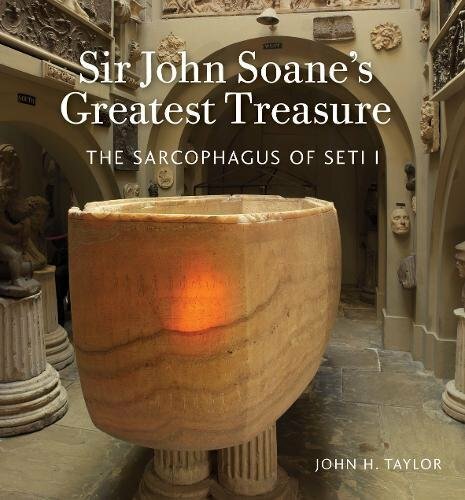 The publication of this volume will coincide with the 200th anniversary of the discovery of the tomb of Seti I, and with a new exhibition revealing the story behind the sarcophagus at the Sir John Soane's Museum (Egypt Uncovered: Belzoni and the Tomb of Pharaoh Seti I). The six papers published in this volume, presented at a 2015 conference, form one component of a larger project (Africantransitions.it), with the aim of gaining a better understanding of the identity of different cultures involved in commercial trade within Africa and the ideological value placed on the products exchanged. 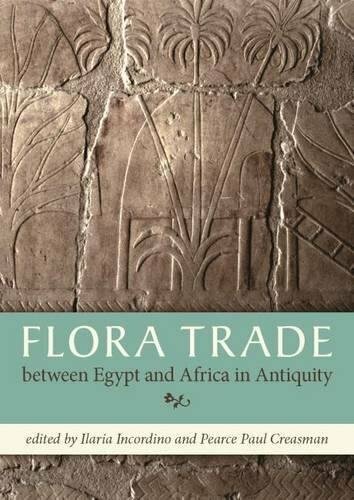 One particularly important trade is the focus of this book: the market in aromata, exotic plants providing perfumes and spices vital to daily and religious rituals. The quest for these plants played a crucial role in economic and political life; pharaohs such as Hatshepsut and Sahura of the Fifth Dynasty used their expeditions to Punt, Nubia and further afield in search of aromata as propaganda to support their rule. Ilaria Incordino compares this with the modern demand for oil: in both cases we see how a trade monopoly in expensive goods brings immense power over a strategic area. Her paper focuses on a case study by a multidisciplinary team (including linguists, philologists, anthropologists and archaeologists) to collect and analyse all textual and iconographic references to five particular exotic products (in particular the enigmatic ti-shepes) to shed light on the mythological and ritual meanings of these products and how, in a country usually reluctant to adopt outside influences, these foreign imports came to be fundamental to the survival of the state through their use in communicating with the gods. Other contributors, from a wide range of Egyptology-related disciplines, offer a diverse series of articles, including: exploring the mythology that justified the need for oleoresins in ancient Egypt; the trade in and use of two particular aromatic resins imported from Punt and Nubia during the Old Kingdom (traced through the lexicographical study of their names) together with other ‘goods’ imported at the same time, including dogs, baboons and leopards; and the role of the Middle Kingdom fortresses in Nubia in protecting goods and controlling trade and navigation on the Nile. One paper written in Italian discusses the damaged text of a Twentysixth Dynasty stela, which refers to a violent rain shower “such as had never been seen in the mountain of Punt”, and uses this to discuss the possible location of the mines of Punt. Dieter Kurth offers an interesting discourse on the elaborate decoration of a Thirtieth Dynasty coffin, although how this fits with the theme of flora and trade is not clear. While this will be essential reading for specialists and academics, the general reader may have to ‘Google’ their way through the technical jargon of the first paper and the Italian text of the second, but will find plenty of food for thought in the rest of this slim volume. When thinking about ‘ancient Egypt’, and visiting sites with multi-layered histories such as Karnak, it is quite easy to get overwhelmed by the vast amount of information with which you are presented. One way of gaining perspective in this situation is to consider the lives and histories of the individual people who were part of this ancient culture. While this can sometimes be challenging, particularly when the vast majority of ancient Egyptians were illiterate and thus not attested in the textual record, one group of individuals to whom this can be applied (by the nature of their profession) are scribes. 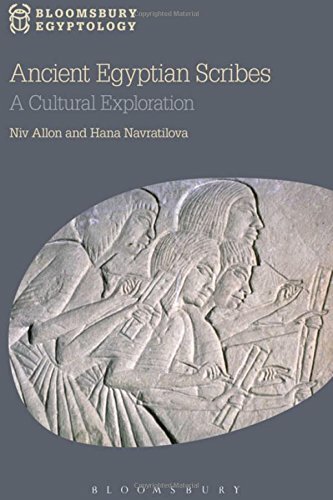 This volume seeks to draw out the details of the lives, careers and material traces of ten New Kingdom scribes, each with their own story of how they made sense of the role of ‘scribe’ and their social standing in New Kingdom society. The authors set the scene by introducing current debates surrounding issues such as literacy, ancient technologies and writing practice, before introducing the reader to the scribes themselves. Each scribe is given a self-contained chapter, so the reader can effectively dip in and out of the book without interrupting the narrative. Some of these individuals are easily recognisable: Senenmut, Tutankhamun and Horemheb are included, while the reader is also introduced to other, perhaps less well-known New Kingdom scribes including Djehutimose Tjaroy, the scribe of the community of royal workmen at Deir el-Medina during the Twentieth Dynasty. The different scribal voices illustrate the diversity of elite, literate roles: from pharaoh to military men and administrators. In taking this approach, the authors prove that the word ‘scribe’ was used to cover many different elements relating to literacy. Through their association with this word, scribes partook in the distribution of power and authority in New Kingdom Egypt. In choosing to focus their study on a specific period, the authors are able to present the differences in scribal activity between the Eighteenth Dynasty and the Ramesside Period without presenting ancient Egyptian culture as timeless and static. An accessible volume, with some illustration, and a must-read for those interested in the lives of the ancient Egyptian ‘literati’. Nestled in the Bibliography at the end of this relatively short volume (144 pages of text) is one book with which I am very familiar: Fighting Pharaohs; Weapons and Warfare in Ancient Egypt by R.B. Partridge (2002), written by our late Editor and type-set by me. Since Bob’s book covers the whole of ancient Egyptian history, I naturally wanted to discover what, if anything, Elliott’s book could add to Bob’s comprehensive account. Interestingly, I see that both share(d) an interest in historical reconstruction so both approached the subject with practical experience of the nature of warfare in pre-industrial times. Although both books cover much of the same ground, this new work does offer some fresh insights and is well worth study by anyone interested in this aspect of ancient Egyptian culture. One noticeable and welcome addition is the use throughout the work of the ancient Egyptian names for the weapons and military personnel, which are also listed in a useful glossary. 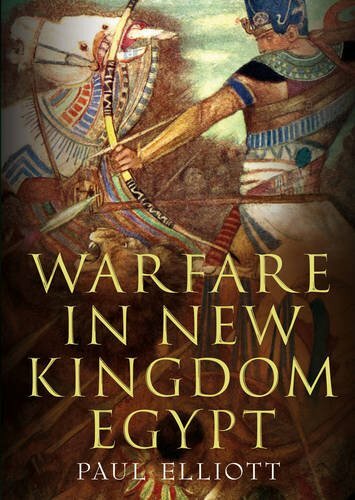 In his introduction, Elliott points out that he has concentrated on the New Kingdom because warfare in the Old and Middle Kingdoms changed little over time; Egypt was isolated from foreign powers, so that it was only when it faced the technology of invaders that its leaders became aggressive and outward-looking. Nevertheless, he sets the scene by looking firstly at the development of the army as a permanent state institution, beginning in the Middle Kingdom, the influence of Hyksos technology, the extensive use of foreign mercenaries, and the founding of garrisons and forts. A chapter deals with the ‘Nine Bows’, the traditional enemies of Egypt, including a description of the Battle of Megiddo; another covers ‘New Enemies’ – from the Kingdoms of Mitanni, and Hatti (including inevitably an account of the Battle of Kadesh) and the Sea Peoples. ‘The Soldier’s Lot’ covers the training of soldiers, their provisions, clothing and armour. The author then covers in great detail the design and use of the various weapons: spears, javelins, shields, axes, different types of swords, bows and arrows, slings and throwsticks. Military operations: chariot tactics, chariot design, siege operations and the navy are all covered, with a final chapter describing how the author reconstructed ancient Egyptian shields using authentic materials. 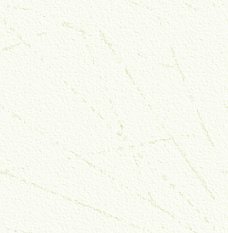 The book is for the most part illustrated with clear line-drawings. Unfortunately, many of the colour plates have been sourced from the internet and are of dubious quality, probably due to issues of copyright costs. Perhaps it would have been better to limit the colour plates to those from the author’s collection.